A cross-country bike trip to raise money for a new program initiative with STOKED, a NYC and LA-based non-profit organization that works to close the opportunity gap for underserved youth. The goal is to raise $50,000 to create a series of “Live A Big Life Scholarships” so that, after completing the 4-year program with STOKED and graduating high school, select youth can go on a trip to broaden their horizons, meet new people, learn new things and learn to live their Big Life. 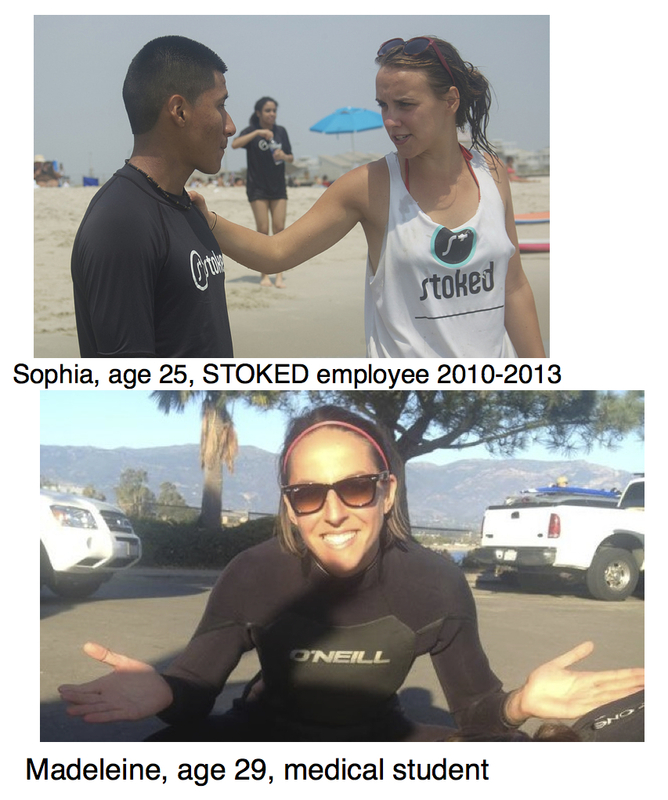 Starting in Santa Barbara, CA and ending in Brooklyn, NY. The major cities we’ll hit are: Santa Barbara, CA; San Diego, CA; Phoenix, AZ; El Paso, TX; Del Rio, TX; Austin, TX; New Orleans, NO; Atlanta, GA; Myrtle Beach, SC; Wilmington, NC; Virginia Beach, VA; Rehoboth Beach, DE; Cape May, NJ; Brooklyn, NY. We are using the extensive resources of the Adventure Cycling Association, piecing together sections of the Pacific Coast, Southern Tier, and Atlantic Coast routes. Follow the “Blog” and “The Route” for more details as we go along. The opportunity to go new places, find challenges outside of your comfort zone, be forced to overcome obstacles and problem solve will fundamentally change any person. We are lucky enough to have the opportunity to do this, and we want to create that same opportunity for the youth in STOKED. Thank you for visiting liveabigliferide.com! 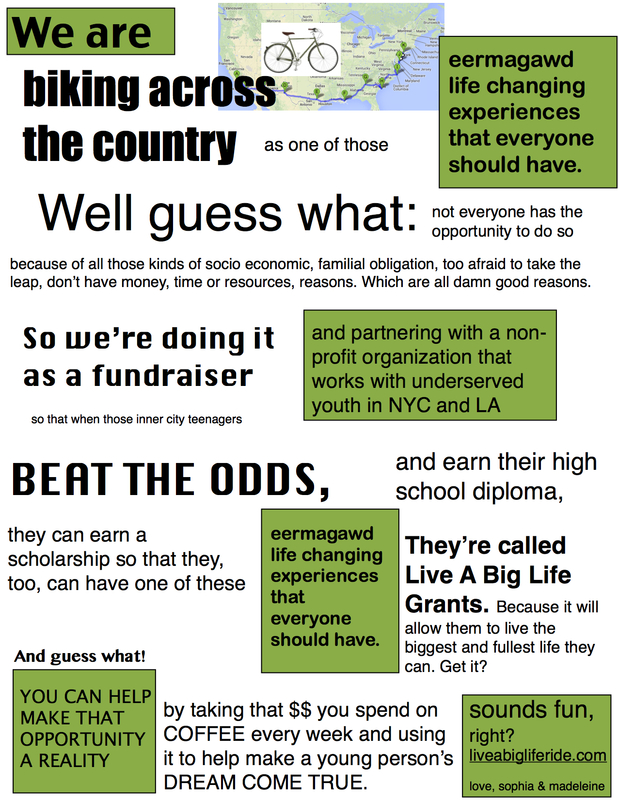 The Live A Big Life Ride is a bicycle ride across the United States, that is a fundraiser for the Live A Big Life Fund and STOKED. The Live A Big Life Fund is in memory of Cameron Howe, a young man who passed away in the fall of 2012, and the fund supports STOKED, a Brooklyn, NY based non-profit organization which uses action sports, after school programs and mentoring to close the opportunity gap for inner city youth in New York City and Los Angeles. Living a big life is living to your fullest potential, taking risks, and going for what you want out of every day. Cameron lived a big life, we’re living our big life, and we’re off to cross the country to find out how people across America live big lives every day. Please use the links at the top of the page to find out more about us, the ride, the what this funds! Only have a minute? Donate now! Donate to help underserved youth live their big lives today.